Subject: EMAIL ADRESS LUCKY WINNER. RESULT OF THE INTERNATIONAL POOLS LOTTERY. AVENUE NKRUMAH KWAME SECTOR,14OUAGA 01 BP. € 850,000.00 (Eight Hundred and fifty Thousand (Euros). Due to mix up of some numbers and names, we ask that you keep your winning information confidential untill your claim has been processed and your money Remitted to you. All participants were selected through a computer raffle system drawnfrom over 20,000 company and 30,000,000 individual's email addresses from all over the world. 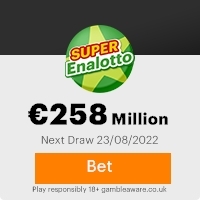 This promotional program takes place every year.This lottery was promoted and sponsored by International software organisation committe,we hope as a lucky winner,you will be part of our next year( 1 million Euro) Lottery Bonanza. To file your claim, please contact our claim agent named: Officer BUTAM IBRAHIM to obtain your winning Form and the Government Tax clearance for your won prize to be released and transfered to you. Contact your claim officer for due processing and remittance of your prize money to a designated account of your choice. "Remember" that you must contact your claims officer through the email address as written above to obtain your winning form and The Government Tax Clearance. Your winning certificate shall be given to you for the endorsement of your winning cheque which shall be paid by our corresponding bank to your designated bank account. We assure our winners utmost security of their prizes without no hitch following our Protocol to release the prize to the bonafide winners. Winner are therefore notify that the Award Giving Day is on the 12th of November,2007. Winner's file should be completed and forwarded to the payment department before this date. to your claim officer through his email address and telephone number as given above.Should there be any change of your address, do inform your claims officer as soon as possible. Congratulations once again from the staff of this Organisation,we thank you for being part of this year promotion program and wish you a continuing good fortunes. This Email with the Subject "EMAIL ADRESS LUCKY WINNER." was received in one of Scamdex's honeypot email accounts on Thu, 01 Nov 2007 05:41:19 -0700 and has been classified as a Generic Scam Email. The sender shows as International Lottery Promotions. <winn_bon-anza_63@hotmail.com>, although that address was probably spoofed. We recommend that you do not attempt to contact any persons or organizations referenced in this email, as you may expose yourself to scammers and, at the very least, you will be added to their email address lists for spam purposes.